Provence (French pronunciation: ​[pʁɔ.vɑ̃s]; Provençal: Provença in classical norm or Prouvènço in Mistralian norm, pronounced [pʀuˈvɛⁿsɔ]) is a geographical region an historical province o sootheastren Fraunce, which extends frae the left bank o the lawer Rhone River on the wast tae the Italian border on the east, an is bordered bi the Mediterranean Sea on the sooth. It lairgely corresponds wi the modren admeenistrative région o Provence-Alpes-Côte d'Azur, an includes the départements o Var, Bouches-du-Rhône, Alpes-de-Haute-Provence an pairts o Alpes-Maritimes an Vaucluse. The Romans made the region intae the first Roman province beyond the Alps an cried it Provincia Romana, which evolved intae the present name. It wis ruled bi the Coonts o Provence frae thair caipital in Aix-en-Provence till 1481, when it acame a province o the Keengs o Fraunce. While it haes been pairt o Fraunce for mair nor five hundrit years, it still retains a distinct cultural an lingueestic identity, pairticularly in the interior o the region. 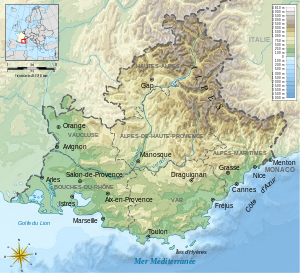 ↑ See airticle on Provence in the French-leid Wikipaedia. ↑ 2.0 2.1 Le Petit Robert, Dictionnaire Universel des Noms Propres (1988).